Rate this project Cecil Watson has announced the release of LinHES 8.4, the latest stable version of the specialist Arch-based distribution designed for set-top boxes and home entertainment computers. This release features OpenPHT, a community-driven fork of Plex Home Theatre: "The LinHES development team is pleased to announce the release of LinHES R8.4. LinHES R8.4 updates MythTV to 0.28-fixes as well as updates to the kernel, system libraries, NVIDIA drivers and many other parts of LinHES. LinHES R8.4 has moved to OpenPHT, a fork of Plex Home Theater and Kodi has been updated to 16.1. Also, the /myth/recordings directory has been improved to better support Plex media scanning. Simply create a Plex library with Myth in the name (i.e. Myth TV Shows , Myth Movies or Myth Sports) and the directory (/myth/recordings/TV Shows, /myth/recordings/Movies or /myth/recordings/Sports) and the Plex library will be re-scanned when /myth/recordings is updated." See the release announcement and release notes for more details and upgrade instructions. Download link: LinHES_R8.4.iso (913MB, MD5). Rate this project Cecil Watson has announced the release of LinHES 8.3, an updated release of the project's specialist Arch-based distribution designed for set-top boxes and home entertainment computers - now complete with the new Kodi media centre: "The LinHES development team is pleased to announce the release of LinHES R8.3. LinHES R8.3 brings updates to the kernel, system libraries, NVIDIA drivers, the latest MythTV 0.27.4 fixes, and many other parts of LinHES. LinHES R8.3 now includes the option to install Plex Home Theater. Additionally XBMC has been updated to Kodi. Related issues: bug #983 - xscreensaver missing some screen savers; bug #985 - missing shared libraries for zoneminder; feature #981 - add Plex Home Theater; feature #982 - add PowerPanel for CyberPower UPS; feature #984 - LinHES Tools in Service Menu; feature #986 - xconfig.sh should detect and install NVIDIA and legacy driver; feature #988 - update XBMC to Kodi...." See the release announcement and release notes for further information and upgrade instructions. Download the live DVD image from here: LinHES_R8.3.iso (818MB, MD5). Rate this project Cecil Watson has announced the release of LinHES 8.2, the latest stable version of the project's specialist Arch-based distribution designed for set-top boxes and home entertainment computers: "The LinHES dev team is pleased to announce the release of LinHES 8.2. 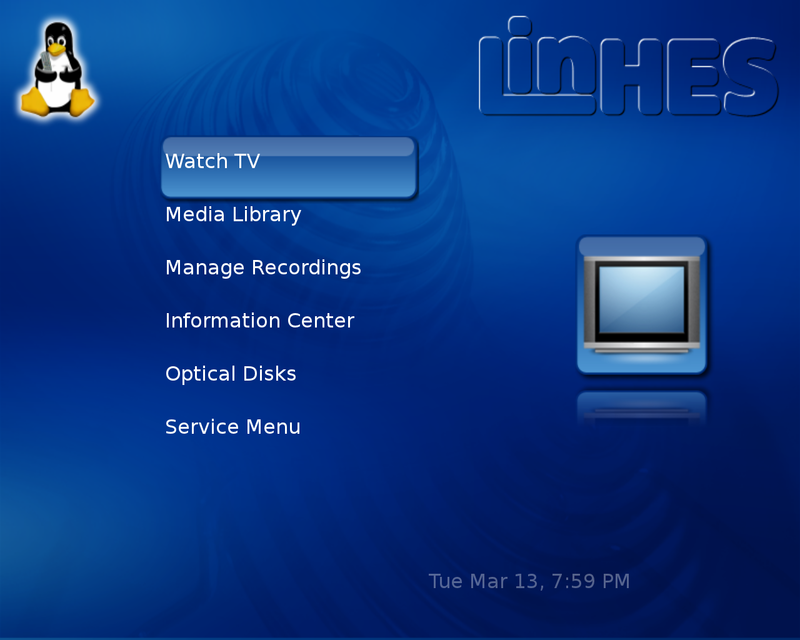 LinHES 8.2 brings updates to the kernel, system libraries, service menu options, MythTV 0.27.4, LinHES theme and many other parts of LinHES. Due to consolidating /bin, /sbin, /usr/sbin, to /usr/bin upgrading to 8.2 is more involved than the normal pacman -Syu. There are two options to update, the update81-82.sh script or upgrade from the ISO. The update81-82.sh script will assist in updating LinHES. As always, make sure you have a good backup. There is no backout plan or partial update, once started the upgrade needs to complete or the system may not boot correctly. The largest stumbling block that will cause the update to fail is non-LinHES packages that have been installed. Please uninstall the non-LinHES, update to R8.2 and then re-install the 3rd party packages." See the release announcement and release notes for more details. Download: LinHES_R8.2.iso (685MB, MD5). Rate this project Cecil Watson has announced the release of LinHES 8.1, an Arch-based distribution for set-top boxes featuring the MythTV home entertainment application: "The LinHES dev team is pleased to announce the release of LinHES R8.1. This builds upon R8.0 and is the first LinHES release using MythTV 0.27. Special notes: because MythTV is not compatible with older versions, all installs should be updated at the same time; If a system is not updated it will not be able to communicate with the other systems until after it is updated. 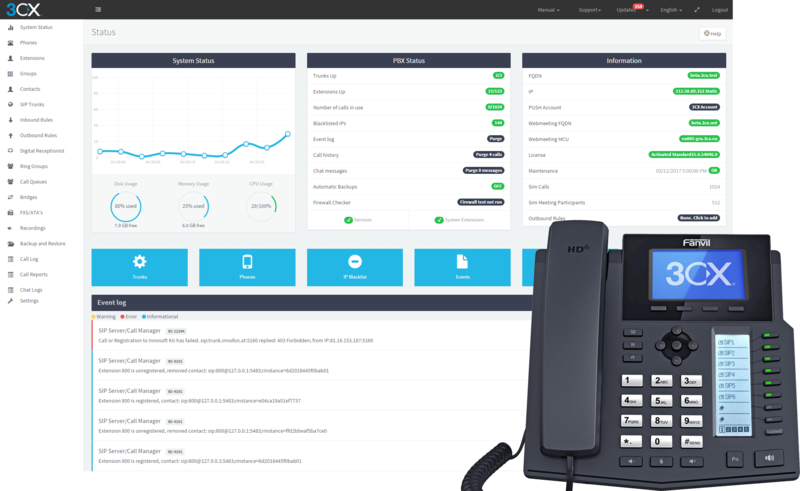 Special upgrade notes: for people with remote frontends or slave backends the order of upgrade matters - first upgrade the master backend then slave backends, finally remote frontends may be upgraded; it is not possible to update to this release with versions older than R8.0. Changes: MythTV 0.27 with fixes; removal of classic local website. New stuff: Xymon alerts will appear on the console as well as via OSD; new default LinHES theme." Read the release announcement and release notes for further information. Download: LinHES_R8.1.iso (688MB, MD5). Rate this project Cecil Watson has released version 8.0 of LinHES (which stands for "Linux Home Entertainment System"), an Arch-based Linux distribution centred around MythTV. The biggest change of the release is the switch to the x86_64 architecture. From the release notes: "With this release of LinHES several things have changed. The main thing to note is that with this release, LinHES will support 64-bit processors only. This change, along with a partition layout change means that an in-place upgrade of an existing system is not possible. All installs of R8 should be treated as new installs, with the option to import the old recordings, if desired. R8 uses the same version of MythTV as R7, so importing the old recordings should be very straightforward." Other notable changes include: "old NVIDIA drivers have been dropped; Fbsplash has been replaced with Plymouth; GRUB 2 has replaced GRUB; Fluxbox has been replaced by Enlightenment as the default window manager...." Download: LinHES_R8.0.iso (670MB, MD5). 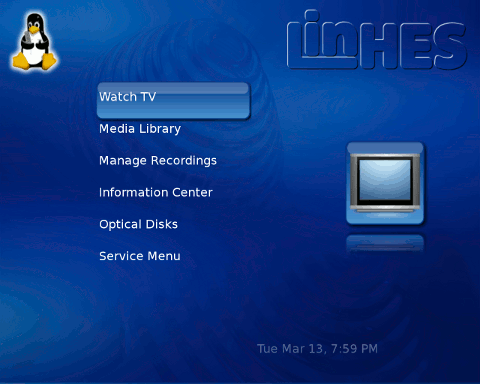 Rate this project Cecil Watson has announced the release of LinHES 7.4, an Arch-based distribution centred around MythTV and designed for Home Theatre PCs (HTPC): "It was nine years ago today that KnoppMyth R1 was first released. It was also 9 years ago when I first met R. Dale Thomas (rdt). Unfortunately, the good ones depart us all too soon. I miss my friend and so it is in his honor I release LinHES R7.4 to mark the ninth anniversary of KnoppMyth/LinHES. The changelog is sparse. This release is primarily to mark the anniversary and to remember our friend. ripD was originally written by me but he spruced it up a great deal. It originally only mirrored a DVD. Since MythTV no longer has menu entries for backup your DVD, I've added the functionality to LinHES. Also included is MythTV 0.25.2. If you are running LinHES R7.3, a simple 'pacman -Syu' will do." Here is the brief release announcement. Download: LinHES_R7.4.iso (693MB, MD5). Rate this project A new version of KnoppMyth, a KNOPPIX-based distribution with the goal of simplifying the installation of GNU/Linux and MythTV, has been released: "I'm happy to announce the release of KnoppMyth R5F27. R5F27 includes the latest version of MythTV 0.20.2 fixes, in addition to other goodies that you've come to expect from KnoppMyth." 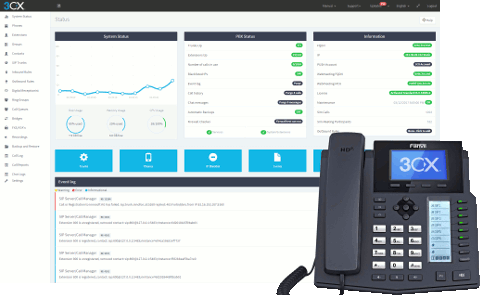 From the changelog: "Changed sources to Etch; remove software suspend2 from kernel; updated V4L/DVB modules, MadWifi to 0.9.3.1, LIRC to 0.8.2-CVS, Webmin to 1.350; more updates for our Australian users; updated NVIDIA drivers (71xx, 96xx and 9755); updated NVIDIA installation scripts; updated MythWeb; added Myth2XviD and MythWebFlash; updated ffmpeg to 20070329 and xine-lib to 1.1.7; added WINE; updated MPlayer; added r8180/8187 wireless modules; added KnoppMyth Radio...." Please visit the project's home page to read the release announcement. Download (MD5): KnoppMythR5F27.iso (616MB); also available via BitTorrent.